The Green Tree Woman's Civic Club meets on the first Thursday of the month at 7:00 p.m. in the Carlisle Social Hall in the Green Tree Fire Department building at 825 Poplar Street in Green Tree. Check the Calendar of Events on this website to check on meetings and details. Guests welcome! We offer a variety of events, refreshments, and entertainment while working towards making Green Tree and the world a better place. The Green Tree Woman's Civic Club donated the Green Tree Giving Center (made and donated by Bob Bennett) to the Borough of Green Tree on Monday, December 7, 2015. It is used for community groups to collect items for various causes such as Operation Shoebox, to send snacks and toiletries to soldiers overseas, or for the Green Tree Rotary's Annual Food Drive. Collections are currently be accepted for Boy Scouts' Scouting for Food campaign, the Civic Club's Celebrate Our Heros (soldier shipments), and the Rotary's October Food Bank collection. It is available for use by all Green Tree community groups. Requests for use of a portion of the Giving Center should be made by clicking here to download the request form, or can be done in person at the Green Tree Administrative Office. 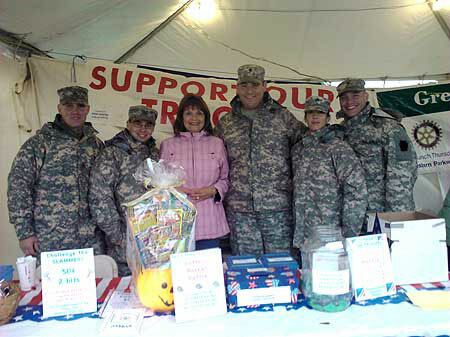 Celebrate Our Heroes collects and sends supplies to overseas troops. The Green Tree Woman's Civic Club would like to thank Green Tree Borough and the community for their support of this vital project. Our efforts will continue to help support the members of our armed forces. Drop off your donations at the Giving Center in the Green Tree Municipal Center outside of the library entrance.